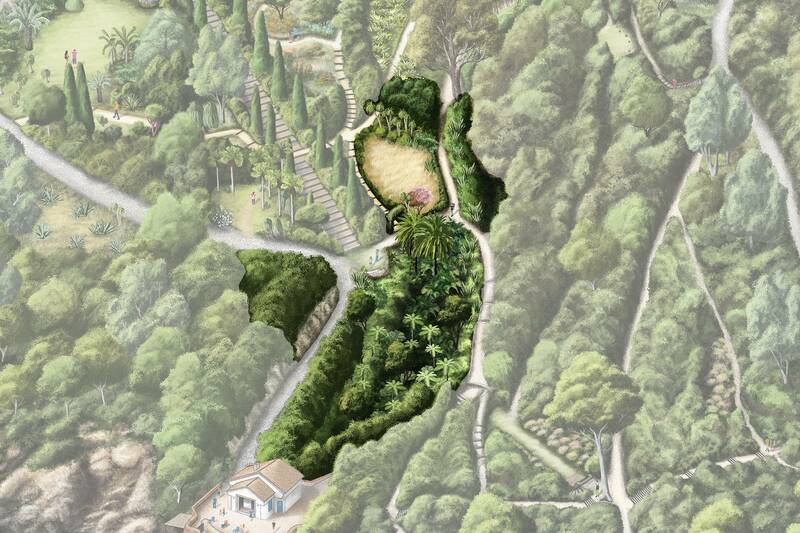 In the heart of the valley of the Domaine du Rayol, which leads up to the Maison de la Plage, flows a temporary stream. In this plunging valley lie the landscapes of New Zealand, the country of the Maori. The hollow of the valley evokes the subtropical, humid and lush forests of the North Island of New Zealand. 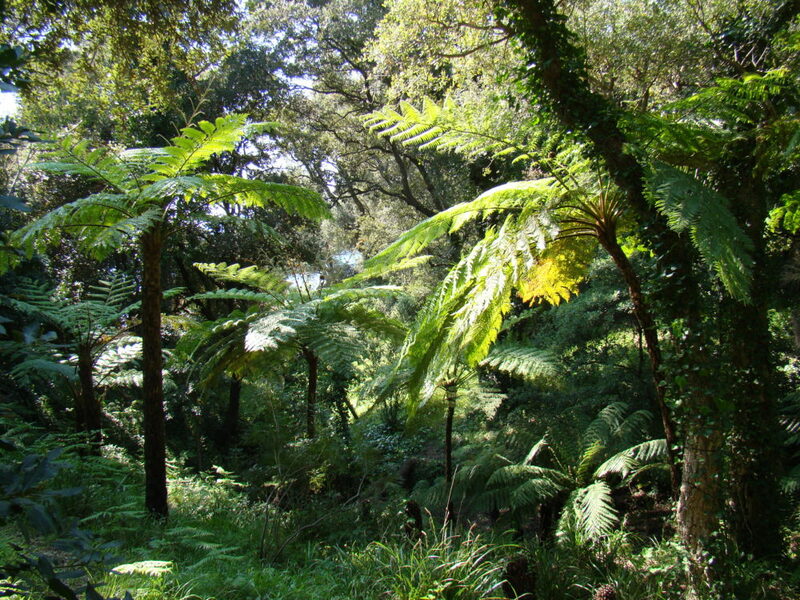 Here grow tree ferns – Cyathea ponga ferns with their thin trunks, and Dicksonia wheki ferns with their broad trunks. The atmosphere seems to be frozen in a distant geological era, when Jurassic dinosaurs roamed the fern forests. A little further on, there is a beautiful grove of large Rhopalostylis sapida nikau palm trees, some of which are already in bloom; at their feet are the Phormium tenax harakeke with their strange inflorescences. On the sides of the valley, two Agathis australis kauris have begun their long life. They come from seeds germinated from Tāne Mahuta in the Waipoua Forest; at about 2,500 years old, it is the oldest kauri in New Zealand. Tussocky grassland typifies the drier areas of eastern New Zealand, which receive little rain and are swept by foehn winds. This tussocky grassland comprises several local species of grass (genera Chionochloa and Poa) and of Carex. 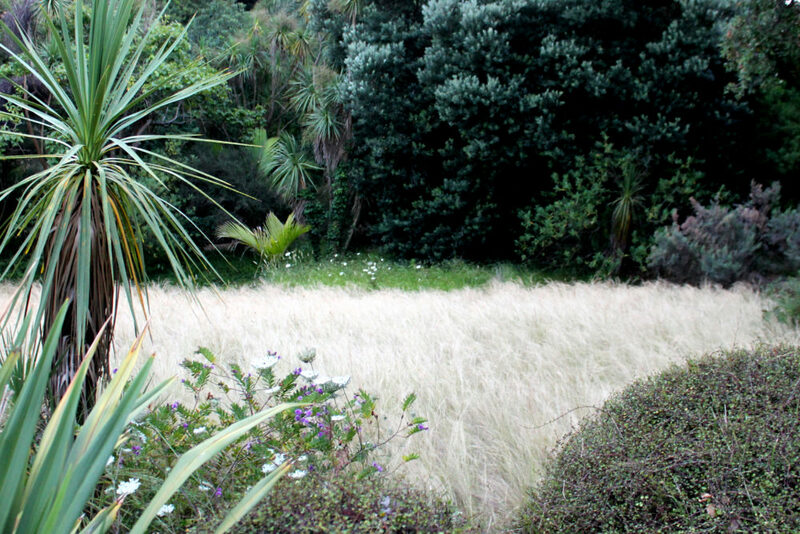 Here, the landscape has been created using another species, Stipa tenuifolia. The result is astonishing. This grassland is surrounded by the Leptospermum scoparium manuka with its massive carmine flowers, Sophora microphylla kowhai, beds of Hebe sp koromuko and is dominated by the twisted trunks of Cordyline australis tikouka. Above reigns a huge Metrosideros excelsa pohutukawa, magnificent when its purple flowers come into bloom in early summer.